Beautiful blankets in various sizes are made from recycled sari fabric. Carefully hand stitched in the traditional Kantha style, each blanket is unique and takes between 5 to 25 hours to make (depending on the size). Kantha is an ancient traditional India craft. Women throughout generations have used this technique to re-purpose worn saris into beautiful bedding and clothing. Long before machine cotton arrived, saris and fabric were hand-loomed. The Kantha technique uses 6 layers of sari fabric which are then sewn together using a running stitch. This is applied in amazingly straight lines from one end to the other. The result is stunning and re-purposes beautiful saris into unique cotton blankets and throws. 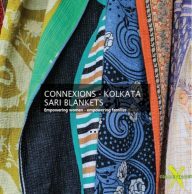 ConneXions currently has 65 women working Kantha blanket production. Many of them learnt the skill of Kantha stitching from their mothers and grandmothers. They spend a few months training to ensure they reach our quality standards, design requirements and sufficient speed. After this, they collect raw materials from the ConneXions offices and stitch from their homes. The women are paid an agreed piece rate for each size blanket. Through this work, they are able to significantly contribute to the well being of their families.